Growing up in Washington State during the 1970’s meant hearing tales about Bigfoot. We “country” people knew the legends to be just that, legends and tall tales, it was the “city” folk who swallowed the stories hook line and sinker. Locals worried about brown bear encounters, visitors asked about Bigfoot sightings. My grandparents owned a farm an hour from Redmond. The 40 acres sat in the middle of the King County, which, when I was growing up was in the heart of logging country. My grandparents were good friends with some members of the Snoqualmie tribe. Fred, one of the tribal elders, would use Bigfoot as a way of scaring us kids out of wanting to camp in the woods. When the thought of bears did not scare us Bigfoot’s name was brought up. We knew the wild hairy man was myth, but still…. We never did manage to get the nerve up to camp to far from home. Of course it is fun to think that there just might be an unknown creature living in the wilds of North America. The idea that something so wild and free can elude modern man is kinda romantic. Maybe this is why so many people want to believe that there are 8-foot tall bands of primates living in the woods. Thanks to mass media Bigfoot is alive and well. He sells Jerky ads and is featured in several “reality” shows, most notably “Hunting for Bigfoot”. Thanks to The Discover Channel, gullible people tune in each week as “expert” Squash hunters make fools of themselves as they unsuccessfully try to track down the big guy. 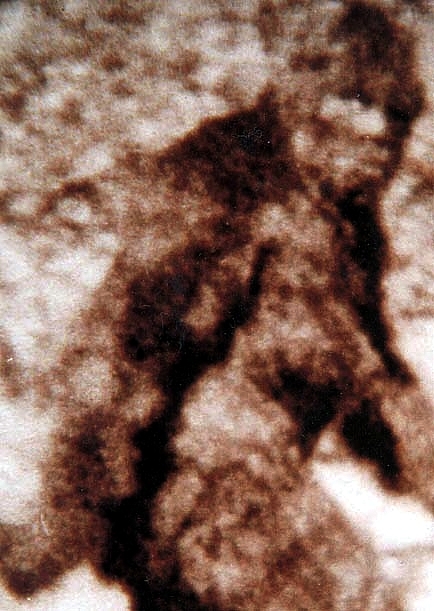 Cryptologists point to the long history of Bigfoot sightings by Native Americans. They love to say that for hundreds of years Native Americans have included Sasquatch in their legends and oral traditions. The problem with this connection is that the wild man that haunts Native American lore is not the same creature that eludes us today. The Native American Bigfoot legends talk of hairy wild men and women who are human, many can even speak local languages. Some suggest the wild men are super strong and are cannibalistic and vicious. In some accounts, Bigfoot is made of stone and can shoot fire out of his fingers! Some are tall and some are very short. The shy primate like giant is not found in any Native American story. In 1920 John Burns, an American schoolteacher who was teaching (acclimating) native children became fascinated by the stories he heard while working in Washington State. He is the one who coined the name Sasquatch. It is an anglicization of a word in the mainland dialects of the Halkomelem language. His stories that were recounted in a magazine told of a tall wild Indians, with long hair and who could use fire, wore cloths and used weapons. So how the hell did we get a hairy primate out of these stories? In 1957 the town of Harrison Hot Springs in British Columbia decided they needed some publicity. The Government was giving out $600 dollars to towns that would come up with a project celebrating the centennial. What better project than to stir up tourism? The stunt? Put on a Sasquatch hunt! Use a mostly forgotten local legend in order to bring in tourists and their dollars. The project was rejected by the government, but the ploy was a huge success! Newspapers all over Canada ran the story and soon hunters and newsmen flocked to Harrison Hot Springs. Though the idea and hunt was silly, many started to take the folklore serious. John Burns came to the town to affirm that Sasquatch was human. So again, how did we end up with a hairy primate? No hunter came back with a sighting claim, but one local man did. In short William Roe said, “that in 1955 while hiking in the woods I came across a very large animal that stood about 6 feet tall and almost 3 feet wide. It was covered in hair. As it came closer I noticed it was female! Her arms were thicker and longer than a man’s. When she walked she placed her heel down first. Her head was higher in the back, her nose was broad a flat. The only uncovered area on her body was around her mouth, nose and ears. When she noticed me she turned her head and watched me for a moment as she walked away. This was more animal than man”. The story spread like wildfire, and one man in particular paid close attention to this account. He wrote about it and then he filmed it. The account I quoted above should sound familiar to anyone who has seen the Roger Patterson and Bob Gimlin footage. In 1966 Roger Patterson wrote a book titled Do Abominable Snowmen of America Really Exist? In this book he cites witnesses and their stories including Roe’s. A year later he announced he was setting off to find this creature, and lo and behold he did just that! He filmed the exact scene Roe described, down to the heel pattern, female anatomy and head turn! It is not surprising that today’s Cryptologists, when arguing for the film’s authenticity ignore the striking similarities of the two sightings. Patterson never let anyone see the original film footage. He made a copy and to this day the copy is locked away in a safe. He died asserting the film was real, though he made little money off of it. The documentary he tried to make was turned down because no scientist would say the film was genuine. To this day the only people who argue for the film’s authenticity are those who firmly believe in the creature. For anyone sitting on the fence over the existence of Bigfoot, this should be enough to finally convince him or her that what started out as Native American folklore has morphed for some into a White American symbol for the last remaining piece of the undiscovered country; the last vestige of the untamed North American forests. For others Bigfoot is the ultimate sideshow gaffe, something to fool the masses with. To all those who still believe Patterson and Gimlin caught the legendary beast on camera I can only say that P. T. Barnum was right; there’s a sucker born every minute. Actually, Barnum didn’t say this, his competitor George Hull did. People like Hull and Roe are lost to history, but real showman like Barnum and Patterson live on. Funny. I grew up in N. California (near Oregon), and we were sure Bigfoot lived in our backyard. Where did you grow up? Perhaps you had hippy Bigfoot living near you. This would be closer to the Native tradition of a long haired wild- man. I divided my time between the woods near Redmond WA, and Santa Rosa CA. I love and miss both. Humboldt County, near Eureka–lots of big Redwoods for Bigfoot to hide behind! Love Humboldt County. It has some of the most beautiful hidden gems in California. I love some of the smaller towns and the old Victorian homes. I do miss the Redwoods. Before I divorced I was living in Mendocino County on five acres of Redwoods. This sounds my kind of book, Sari! I’m pleased that, as your Amazon link says, the author goes into the psychology of why some need to believe in cryptids despite a lack of reliable and consistent evidence. I think the same applies to believers in King Arthur, a subject I know a little about. When you get reports of something out of the ordinary it’s natural to be curious, but when the response is “There must be something in it” a little critical thinking always comes in handy lest one falls for it hook, line and sinker. Yes, the last two chapters go into detail about the how and why people believe in mythical creatures. The authors discuss the idea that finding one of these creatures will disprove evolution. They rip apart the creationists argument that finding a dinosaur in Africa will prove intelligent design. They remind readers that we do have “dinosaurs” living among us in birds and alligators. Years ago I read Geoffrey Ashe’s book, The Discover of King Author. Though Ashe does not convince me he found the larger than life King, I found the book fascinating and full of archaeological finds I had never heard of. I love books about King Author, he would be the mythical creature I would most want to be true. I reviewed a cryptozoologist’s dragon book here recently, and it just felt like wishful thinking. And the author had trained as a conventional zoologist, which made it even more irritating that he ignored basic scientific methodology. Love your references to King ‘Author’! Ashe falls into the trap of looking for parallels between genuine history and blatant myth-making, finding them and then saying one vindicates the other. He says it in more scholarly language but it’s still pseudohistory. He sent me a copy of his original paper for review in the early 80s, and though I was nice enough about it in print I wasn’t at all convinced then, and less so now. How funny, we read the same book and had the same thoughts on Ashe. I read it years before I heard the word pseudohistory. I just assumed he wanted to believe so he twisted the facts to suite his hypothesis. Thank you for the link. I enjoyed your post. I find many books like this one do not offer opinions on how to counter crackpot beliefs, but then again I am not sure we can. When people feel they are right about something, especially if this belief informs their world view, nothing you say will open their eyes. I had an uncle who believed Obama was out to destroy America. We had some heated arguments over his beliefs and though I could point to fallacies in his arguments, he would only say “Sari, this is what you get for having a liberal education”. Apparently having a degree had somehow warped my judgment. I have yet to master a snappy comeback to those who say climate change is a fraud. I’m working on it though!